BIRMINGHAM, ENGLAND (2-March) — A sloppy morning session on Day 2 of the IAAF World Indoor Championships saw 12 men disqualified, including the United States' gold medal hope in the men's 3K: Olympic silver medalist Paul Chelimo, whose third-place performance in the heats was invalidated for taking one step outside the rail. That Chelimo lost his balance due to the jostling and tight nature of the men's pack up front doesn't matter, nor does it matter that he gained no conceivable advantage from the single step outside the rail. It only matters that he took the step on the curve of the track and not the straight. USATF will not protest the decision, representatives from the organization confirmed this afternoon. The seemingly senseless DQ is similar to the one handed down to Colleen Quigley last summer after she qualified to the steeplechase final at the world championships. "It's devastating," Chelimo said after he learned of the decision. "It's an indoor track and it's banked and we're running 15 laps, what do you expect? It's not going to be 100 percent — someone is going to lose a step. And it happened today, it was me who lost a step. "Whatever I was doing was not intentional. . . . I stepped inside the rail by mistake." The ironic part is that Chelimo's disqualification opened the door for his teammate, Shadrack Kipchirchir, to advance to the final. The 10K specialist, widely believed to be a potential medal contender, fell off the pack in the first section after being jostled. "Unfortunately, it's not... I'm not happy for this," Kipchirchir said. "I would not be happy for being disqualified for cutting in. I don't like it that way. I'm not happy about it. When I go to the final, I'll fight til the last minute, give all I got. I'm going to be 100 percent for sure, but that is not what I wanted. He's my buddy. To DQ him and put me in instead... I would rather stay here, but I cannot do anything." Chelimo said he is happy that Kipchirchir will run the final, yet could not help feeling overwhelmed with disappointment. "I qualified the right way," he said. "I was top four, that's what I worked for. I did not get any advantage by stepping inside the rail. The rules are rules. . . . I cannot bend the rules." Below is a full list of athletes disqualified today. Only three delegations (Grenada, Costa Rica and Germany) filed protests on behalf of their athletes; all were rejected. 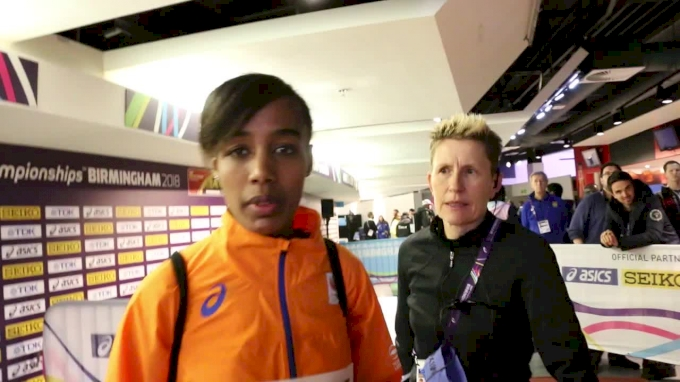 The onslaught of disqualifications brings to mind last night's women's 3K final, in which Sifan Hassan of the Netherlands arguably impeded Laura Muir in the homestretch by running out from lane one to lane three so the Scot was unable to pass her for the silver medal behind Ethiopia's Genzebe Dibaba. After the race, Hassan denied knowingly impeding Muir and claimed "when I'm tired, I cannot control my body." Muir said she did not remember being impeded. An official from British Athletics said today that the organization did not file a protest on Muir's behalf. It's interesting that the line judges were so scrupulous with the rulebook this morning, yet saw no reason to indict Hassan — though her behavior clearly bears at least consideration of IAAF Competition Rule 163.2 (b), which states "if another athlete is found by the Referee to be responsible for the jostling or obstruction, such athlete (or his team) shall be liable to disqualification from that event." The women will race again in the first round of the 1500m tonight. Will today be the apex of DQs and poor line calls? Or are there more technical upsets to come?